74 Winter 2018 PracticeLink.com live & practice After time in New York and Connecticut, Thomas Waring, M.D., found a home in Owensboro, Kentucky. · Photo by Dream Copy Photo See this issue's physicians in exclusive video interviews at Facebook.com/PracticeLink people coming to see the Huskers play. "Saturday is a flood of red," Bangert says. 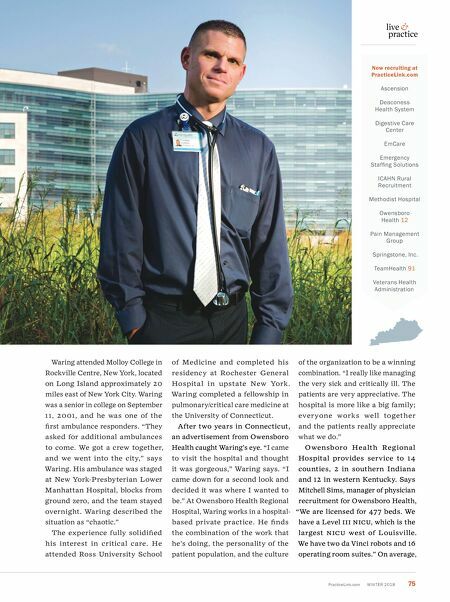 In Lincoln, CH I operates CH I Hea lth St. El izabeth, a 2 6 0 - bed fu ll-service hospital. The hospital has a neonatal intensive care unit, a cardiovascular line and a pediatric surgery line. The hospital is also the accredited burn trauma center for the entire area. Says Bangert: "I'm recruiting for specialties across a broad spectrum: primary care, internal medicine, family medicine, cardiothoracic surgery, pulmonology, critical care, neurosurgery, neurology, nephrology and emergency medicine." Another employer of physicians in the Lincoln area is Bryan Health. Bryan Health operates the Bryan Medical Center West and East Campus. There are 640 beds between the two campuses. Carol Friesen, vice president of health system services for Bryan Health, sees her organization as an advantageous place for younger physicians to accelerate their careers. "Our medical staff leadership at Bryan has traditionally been very young," says Friesen. "We're not like, 'You have to be in the last 10 years of your practice to become a leader.' Physicians have this opportunity earlier in their careers than other communities." Friesen says that 80 to 90 percent of physicians who come for a site visit sign an offer letter. 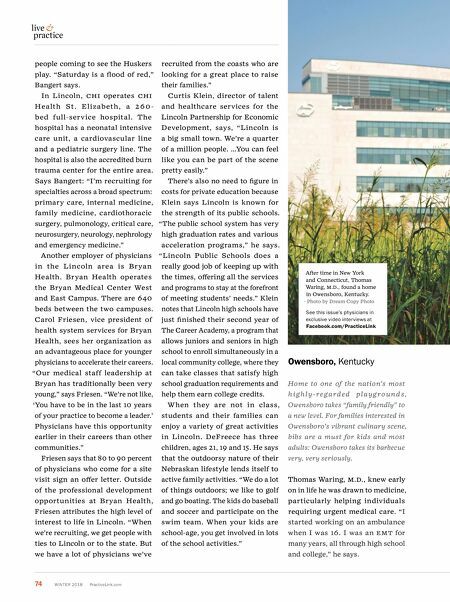 Outside of the professional development opportunities at Bryan Health, Friesen attributes the high level of interest to life in Lincoln. "When we're recruiting, we get people with ties to Lincoln or to the state. But we have a lot of physicians we've recruited from the coasts who are looking for a great place to raise their families." Curtis Klein, director of talent and healthcare services for the Lincoln Partnership for Economic Development, says, "Lincoln is a big small town. We're a quarter of a million people. …You can feel like you can be part of the scene pretty easily." There's also no need to figure in costs for private education because Klein says Lincoln is known for the strength of its public schools. "The public school system has very high graduation rates and various acceleration programs," he says. "Lincoln Public Schools does a really good job of keeping up with the times, offering all the services and programs to stay at the forefront of meeting students' needs." Klein notes that Lincoln high schools have just finished their second year of The Career Academy, a program that allows juniors and seniors in high school to enroll simultaneously in a local community college, where they can take classes that satisfy high school graduation requirements and help them earn college credits. W hen they are not in class, students and their families can enjoy a variety of great activities in Lincoln. DeFreece has three children, ages 21, 19 and 15. He says that the outdoorsy nature of their Nebraskan lifestyle lends itself to active family activities. "We do a lot of things outdoors; we like to golf and go boating. The kids do baseball and soccer and participate on the swim team. When your kids are school-age, you get involved in lots of the school activities." Owensboro, Kentucky Home to one of the nation's most h i g h l y - r e ga r d e d p l a y g r o u n d s , Owensboro takes "family friendly" to a new level. For families interested in Owensboro's vibrant culinary scene, bibs are a must for kids and most adults: Owensboro takes its barbecue very, very seriously. Thomas Waring, M.D., knew early on in life he was drawn to medicine, particularly helping individuals requiring urgent medical care. " I started working on an ambulance when I was 16. I was an EMT for many years, all through high school and college," he says.